Welcome to Watson Removals Southampton – the professional choice among removals companies Southampton. We are a full-service, highly-experienced local firm that specializes in house removals, office removals, and storage solutions. We have a proud history of managing removals Southampton or the wider area. We offer a free removal quote and great prices on moves from a single room, right up to larger properties. We’re also happy to travel across the country, from Southampton to the Midlands, London or the West Country to get you and your possessions safely to your new home. Our skilled staff can also give excellent advice and practical support when you need to move your corporate or commercial goods. This could be anything from desks to shops and factories. We’ve seen it all and would be happy to help safely move your goods wherever you need to get them. We’re already equipped for the job – our safe and reliable fleet means we are ready for anything. We want to make sure our customer gets what they want. That means our removals company Southampton and the surrounding area is flexible about full or part loads. Get in touch for a free removal quote and to discuss your requirements – we’ll see how we can help. We’re also very happy to help out if you’re thinking about moving overseas. We can organize road transport for your goods if you’re moving into Europe, or longer journeys if you are headed for the USA, Canada, Australia or South Africa. That’s not an exhaustive list – talk to us about your destination and we’ll find you a solution. We have secure, safe facilities where we can store goods for you between or after your move. We’re insured to look after your items and they’ll be easy to access whenever you need them. Call us for your free removal quote. Watson Removals is a local firm with many years’ experience as movers. We set out to provide a stress-free, well-organized move for your home or office by planning, communicating and getting the little details right. We consider ourselves to be one of the premium removals companies Southampton has to offer. Our teams are highly-skilled and professional and our fleet has been assembled to be able to cope with every situation. We believe in quality – that should give you the confidence to believe in us. 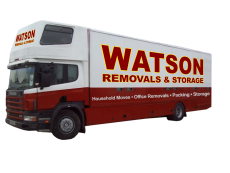 Get in touch with Watson Removals today and we’ll get you your great-value, no-obligation quote.